They're Coming is a 2012 action thriller from Emberlense Productions, with contributions from several Wingless Films collaborators. The film stars Tom Menary as David York, who learns of the disappearance of his wife, Amanda (Kirsty Anne Symonds) after receiving a cryptic note from his old friend, Robert Watts (Mark Vernon Freestone) that says "They're Coming". The screenplay was co-written by Tom Menary and director/producer John Tomkins, and Jim Elton worked as Director of Photography and cameraman. 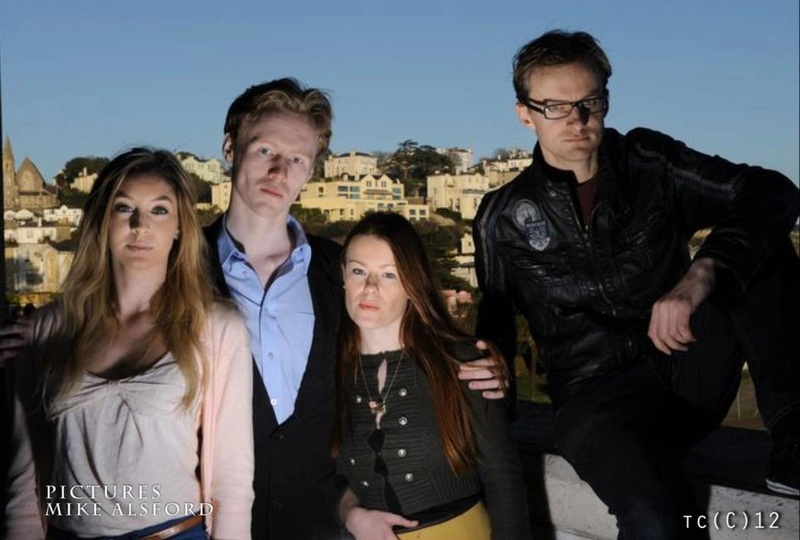 Shot in and around Torquay in March and April of 2012, They're Coming is scheduled for a premiere on 27th September, 2012. Cast and crew during filming. The concept for They're Coming took shape during promotion of John Tomkins' previous film, Like An Angel, in July 2009. After creating a pitch trailer with local actor and Like An Angel alumni Adam Barfield, John sent out a call for scriptwriters via his association with Devon & Cornwall Film. The first draft script was completed in February 2011, written by Lawrence McNeela, with further rewrites by John. Auditions were held on 16th April, 2011 at the Exeter Phoenix, with further auditions on 4th December. 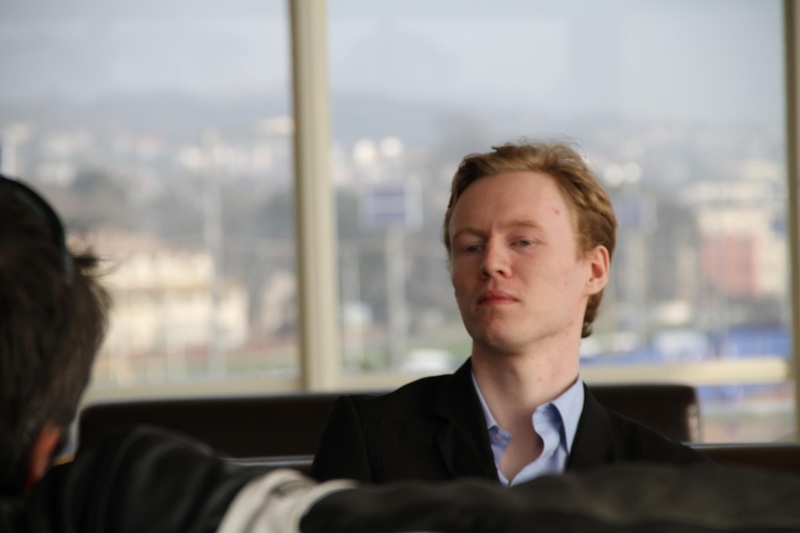 In July 2011, Wingless Films began their association with the film, and on 2nd December Tom Menary was cast as the protagonist, David York, after screen testing with John. He also revised the script through several drafts. Jim Elton was signed on as Director of Photography. Aesthetic Clarity became involved in November 2011, providing extras for the film. As of 6th December, Lexie Carducci, James Cotter and James Coard were officially cast as Sarah Charter, "The Tramp" and security guard Ryan Baines respectively. This day also saw the release of the first teaser poster to feature Tom Menary as David York. 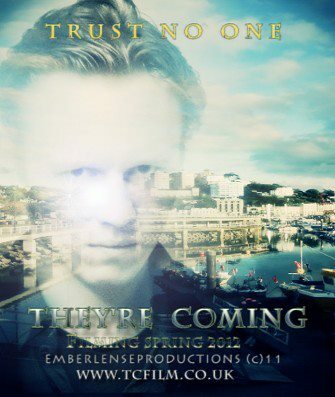 Teaser poster featuring Tom Menary (2011). The film would require a total of twenty-three locations, with scouting conducted in January 2012. A photoshoot with Tom and Lexie was taken at the train station in Newton Abbot, where footage was shot for a teaser trailer. Further auditions for speaking roles were held on 15th January, where Emma Louise Bullions (Secretary Claire Rogers) and Mark Lindsey Earley (Theatre Director Louis Edwards) were cast, and the basement of Dot's Pantry was secured as the location for the film's climax. The film's official Facebook fan page was created on 9th January. The end of January saw visual effects artist David Burbury and stunt co-ordinator Michael Woodcroft join the crew, and Alexander Walker was tentatively cast as Robert Watts, although he was later replaced with Mark Vernon Freestone following scheduling conflicts. Updates were chronicled in the production's first Video Blog. 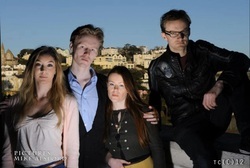 A photoshoot conducted by Western Morning News was held on 5th February in Torquay, with principals from the cast and crew assembled. Sam Morgan was cast as Ian Webber on 7th February, and costumer Sylvia King and composer Dom Lee joined the project. The film's first fight rehearsal was held at the Riviera International Centre on 12th February, overseen by Michael Woodcroft. Members of the cast worked on several sequences for the film's action scenes, including the corridor fight between David York and Ryan Baines. Jim Elton was officially announced as the Director of Photography the following day, and Boyd Rogers was cast as Detective Charles Renner. Further fight and script rehearsals followed over the next few weekends, with much of the main cast and crew assembled in Torquay. Julian Kemp joined the production as sound recorder and boom operator on 19th February, and in the following week permission was secured to film on the centre stage of Riviera International. Julian Lee Seager was cast as Detective Davies. Rehearsals continued into mid-March, and the shooting schedule was released on the 16th, with the start of principal photography set for 24th March, 2012. Tom released his first Video Diary on the night before filming. Promotional photo by Mike Alsford. Filming began at the Shoreline Café in Paignton from 8:30am on Saturday, 24th March. The film's first scene, featuring a conversation between David York and Robert Watts, was completed, with additional, exterior footage shot on the promenade. The scene also featured James Cotter in one of two roles, portraying a waiter. Production moved to outside Queen's Park for David's revelatory phone call with Amanda. Following scenes featured James as his second character, nicknamed "The Tramp" during production, and several sequences in Paignton Library, doubling as the office building of Textile Creative. The final scenes of the day were shot at the Attic Nightclub in Torquay, and featured Boyd Rogers and Julian Lee Seager as the detective duo Charles and Davies. Sunday 25th relocated to Stoke Gabriel in the South Hams area, where interior scenes were shot for Amanda's house, and featured Tom and Lexie. Production moved to Realm Pictures in Torquay for scenes set in Sarah Charter's house, and included a brief scene with Julian Lee Seager. Production relocated to the Riviera International Centre on Monday 26th to film an elaborate theatre sequence involving a score of extras provided by Aesthetic Clarity, as well as actor Mark Lindsey Earley. Kirsty Anne Symonds was present during the shoot, and recorded her lines for the phone conversation with David York at the end of the day. An additional scene was written, dubbed "Scene Zero" and featuring Mark Vernon Freestone. Cast and crew returned on Wednesday 28th for several stunt sequences supervised by Michael Woodcroft in and around Torquay. The following day was dominated by a lengthy chase sequence taking in the Torquay seafront and Rock Walk, and also included the filming of "Scene Zero". 31st March saw a return to Paignton Library for scenes with Sam Morgan as Textile Creative boss Ian Webber, and concluded with a dramatic scene between David York and Robert Watts. The final day of principal photography was spent at Dot's Pantry in Torquay, with the café's basement standing in as the setting for the film's climax. 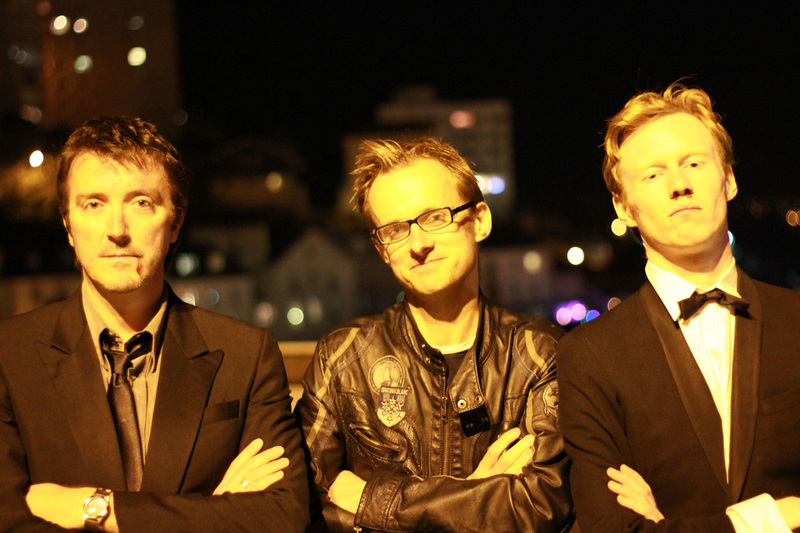 Mark, John and Tom during filming. 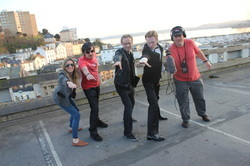 John and the film's leads appeared on John Govier's breakfast show on BBC Radio Devon on 14th April to promote They're Coming. A premiere date for the film was set for 27th September, to be held at the Merlin Cinema in Torquay. The alternative rock band Babysnakes were signed to provide a track, The Reluctant Traveller, for the end credits. Tom Menary composed several tracks for the film, two of which ("Production Titles" and "The Bedroom Scene") appear in the final cut. The film's final day of shooting took place on 26th August, 2012, with pick-up shots around Paignton Library. The scenes, filmed at night, featured a conversation between David York and Sarah, as well as an additional shot for use in the film's finale. John appeared on Paul Moxham's Radio Devon show on the following afternoon to promote the film's premiere. Cast and crew at the premiere. The premiere was held on 27th September, 2012, at the Merlin Central Cinema in Torquay. 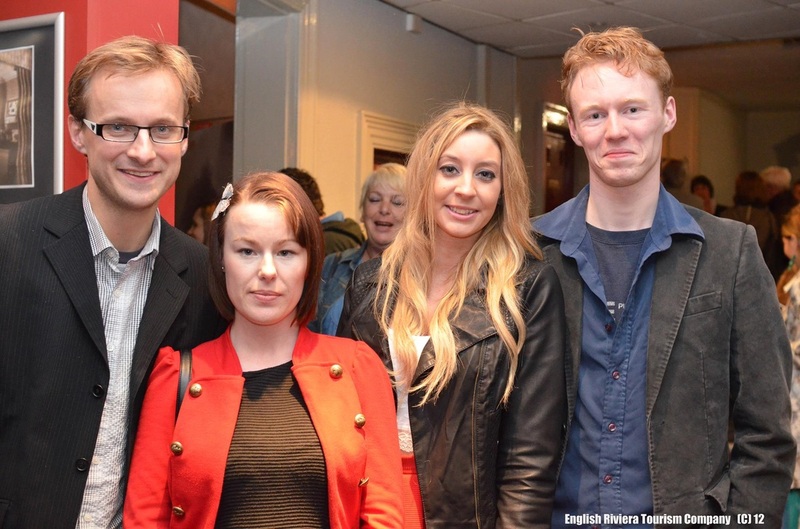 Cast and crew attended, along with representatives from the English Riviera Tourism Company, and film reviewers including Sean Wilson and Molly Povey. The film was also shown in Exeter on 5th December, and a second screening was held in Torquay on 13th June before the premiere of John's follow-up film, A Dark Tale, which reunited many of the cast and crew from They're Coming. Further screenings have been announced for Plymouth, Brighton and London, with a DVD release scheduled for December 2013. A trailer was released on 2nd August to advertise the screening tour. "Week 5: 24th March to 1st April 2012"
"Week 4 March 20th 2012"
"Week 3 March 14th 2012"
"Week 2 March 9th 2012"
"Video Diary #1: The Night Before"
"Video Diary #2A: Day One"
"Video Diary #2B: More Day One"
"Video Diary #3: Smashing Samsungs"
"Video Diary #4A: Driver A"
"Video Diary #5: Stuntman Mike"
"Video Diary #6A: Rock Walk"
"Video Diary #6B: Coffee & T.C." "Video Diary #7: One Week"
"Video Diary #8: Day Six, Part 1: Flock of Seagulls"
"Video Diary #9: Day Six, Part 2: All the Strange, Strange Creatures"
"Video Diary #10: Day Six, Part 3: Train in Vain"
"Video Diary #11: You Spin Me Right Round"
"Video Diary #12: Radio Ga Ga"